19% Jessica watched the sky and imagined how good it would feel to fly up there in the open air. It would be warmer by day, but, then again, there would be more people around to wonder what on earth was happening. Giddiness bubbled in her again, as she imagined how going public might change things. She’d be able to fly openly, in a sunlit blue sky. BLURB: The Menopausal Superheroes are coming out of the closet and the pressure is high, on the job and on the homefront. Now that he knows what it’s like to be a hero, Leonel “Fuerte” Alvarez can’t imagine going back to his former life as a grandmother and housewife. But putting his life on the line may cost him his husband even while he saves the city. Jessica “Flygirl” Roark is holding on to her second chance at love with both hands while learning to balance single parenthood with her new career in crime-fighting. Patricia “Lizard Woman” O’Neill is blindsided by an unexpected romance just as she signs on to join the team. Meanwhile enemies abound–old and new. When superpowers alone aren’t enough, what a woman really needs are her friends. 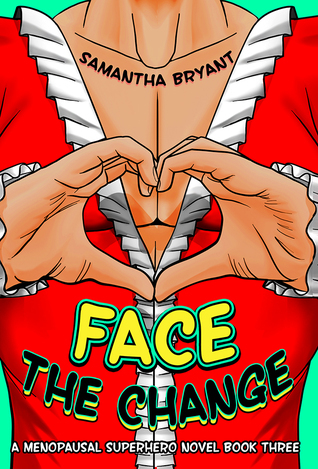 I enjoyed the second book in this unusual take on the superhero genre and was delighted when the author asked if I would like to read the next slice of the adventure – see my review of Change of Life. It didn’t take me long to pick up the storyline of all four of the main characters and I’m enjoying the ride. I’ll be reviewing this one shortly. I’ll be interested to see how this one pans out. Hope you love it. Yes – I’m enjoying it so far, Lynn. It’s an original premise and I liked reading the previous slice of the adventure. Yes – I really enjoyed the previous book and am now back in the groove with this one:). Thank you for popping in! Wow, this sounds….different? I’ll look forward to your review, I’m intrigued! It is certainly different! And it is more of a very affectionate tribute, rather than completely sending up the whole sub-genre. OOh nice teaser! It’s funny, my name was always so popular in school. There’d be like 3 or 4 of us in a class. And yet when I read books, there’s hardly ever a Jessica! Sometimes she might be the mean girl or nemesis. I love when she’s the heroine though! LOL! You’re right! I’ve known several Jessicas – and I think it’s a lovely name. But you don’t read about all that many in fiction. So far so good, Mrs M:). I’ll be reviewing it shortly. It is great fun and because it features older women as superpowered heroines, the whole tone and feel of this adventure is quite different. I’m sure you have very little free time just now, Rae – thinking of you and hoping it’s going well! Thank you for popping by. I really am, Mogsy. It’s great fun and inevitably the dynamic is quite different. This sounds like such a fun read! I love the Menopausal Superhero title. Hope you enjoy this one as much as the previous 2.